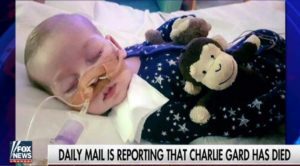 (Baptist Press) — Charlie Gard—the infant at the center of a battle over parental authority that gained international attention—has died, his parents announced today (July 28) in England. “Our beautiful little boy has gone. We are so proud of you Charlie,” his mother, Connie Yates, said in a statement, according to the British Broadcasting Corp. (BBC) News. Charlie died in hospice care a week short of his first birthday, Aug. 4, after being removed from a ventilator. He was born with a rare condition known as mitochondrial DNA depletion syndrome (MDDS). His parents—Chris Gard and Yates — fought numerous legal battles for their son’s life and raised about $1.7 million for an experimental treatment in the United States that he never was permitted to receive.